June 16th, 2010 by KTU | Filed under 3. Framing, Park City Mountain Modern. They are light, so the framers like them. 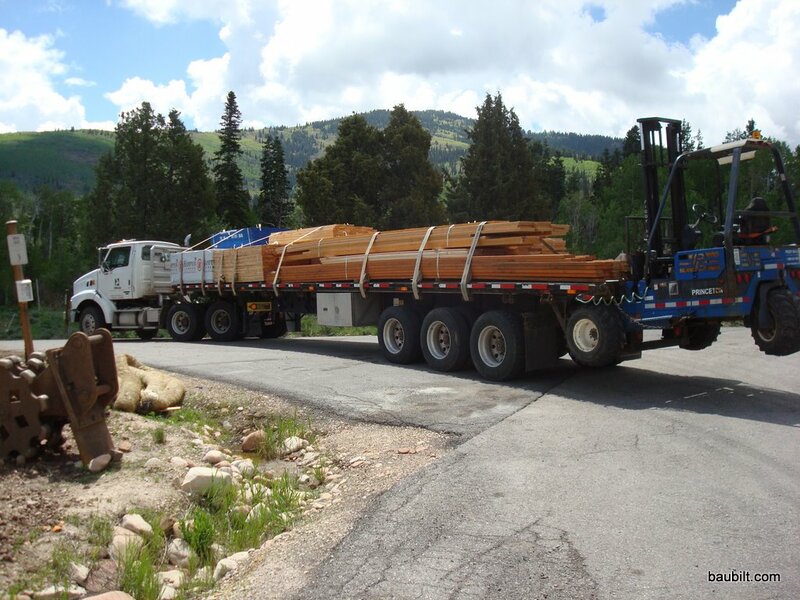 They come in long, long lengths…as long as the trailer you haul them on. Knock-outs are pre-punched in the web of the beam for wiring and small-diameter tubing. They are very strong and stiff (per unit of weight and cost). The standard floor system TJI (like the TJI 210’s used here) are 11 7/8″ high, treated essentially as 1 ft by the time adhesive and rough spots are handled, which matches the dimensions of the standard rim joists used on the perimeter of the floor. The TJI makes very good use of natural resources, allowing plantation lumber to be turned into structural framing members. They are not cheap (about $1.00 – 2.00 per linear foot) of course, but when all is said and done, it’s the way to go and probably comes out as the most cost effective solution. When the decking is applied with glue and nails, this main floor is really solid…not the slightest bit of bounce or give. We’re putting 3″ concrete over the top, with rebar on an 18″ grid, so the resulting floor system should be a rock. LVL (laminated veneer lumber). 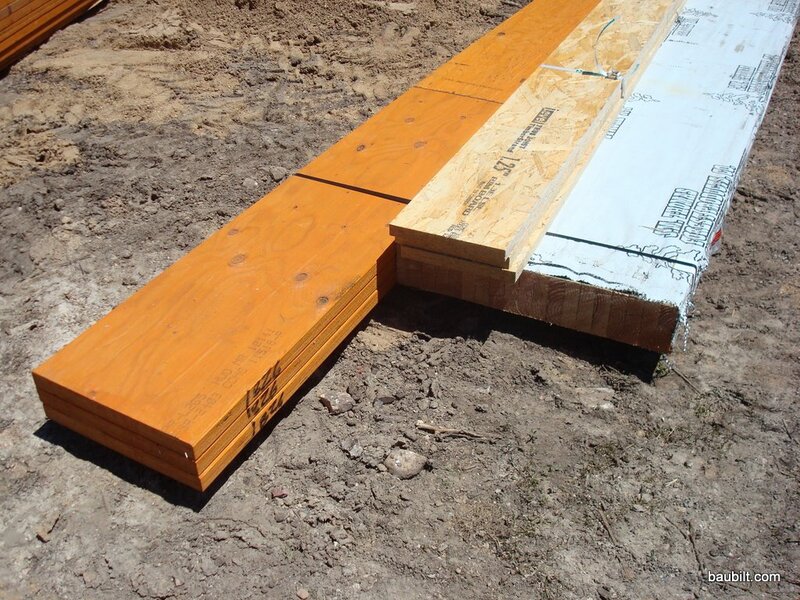 This is basically a “plywood” structural lumber, which in the most common form is 1 3/4″ thick and comes in many different widths, and very long lengths. We use lots of 5 1/2″, 11 7/8″ and some 14″ and 18″. We use three 1 3/4″ x 18″ x 22′ LVL pieces for the header over the double-wide garage door. This is a bit cheaper than using a steel I-beam, and the framers like working with wood more than with steel. Glu-lams (glu-laminated lumber beams). Think of these as a stack of 2×6 boards made into a beam. The dining room “bump out” in the great room of this house has a glu-lam header which is 5 1/8″ x 28 1/2″ x 20′. You can see it on the ground next to the 18″ LVLs. This is a tall beam, which has led the architects to call it a “Glu-wall.” Again, the framers like working with wood more than with steel, and we had the room for it, so I went with the Glu-lam instead of with a steel I-beam. 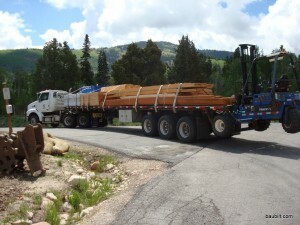 LSL (laminated strand lumber). LSL is a close cousin to OSB. Instead of a panel, LSL is a structural member like an LVL or a glu-lam. It’s not quite as strong as LVL, but still pretty good, and a bit less espensive. In our case, we use LSL for the lower stair stringers. This is a nice application, as you don’t have to contend with knots and imperfections in 2×12 dimensional lumber. Engineered lumber. On the left are 18" wide LVL beams which will be the garage door header. The LSL lumber will be stair stringers. The glu-lam (wrapped) is on the bottom. 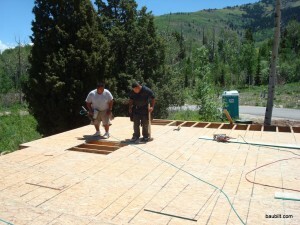 OSB being installed as the main floor deck. This is tongue-and-groove material and is put down with construction adhesive and nails. A sledge hammer turns out to be an important framing tool too. They use it to bring the panels up tight against each other, and sometimes to square-up the structure before nailing. Engineered lumber is one of the areas of significant technological innovation in light construction over the past thirty years. It’s all probably a good thing. The only downside is that these materials are less amenable to incremental modification, which is likely as a building gets to be 50 or 100 years old. I appreciate this living in a 115-year-old stone church. With luck, someone will still be making use of the Park City house in 100 years, and hopefully the use of engineered materials will not interfere with the ability to change and improve the structure at that time. The ProBuild delivery truck with a lot of valuable materials. 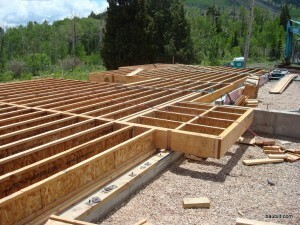 Wondering if you considered using open-web joists for the floor trusses in the house? Probably for your application the floor framing is so complex it didn’t make sense? Great site! Our spans were quite modest, about 14 ft. maximum. As a result, we could use conventional 11-1/4″ TrusJoist floor joists. These are inexpensive, straight, and readily available. If I were spanning 20 ft. or something in an open-plan design, I’d definitely consider either wood or steel open-web trusses. I’m thinking about knocking out an exterior wall to connect my living room and three season room. The Glu Beam you mentioned,how much should I expect to pay for an engineered beam per linear foot? Most Glulam beams run $5-20/linear foot depending on the size of the beam. When bigger than 14-16″ (height of beam) a steel beam may be less expensive. Of course, you need to have someone calculate the required size of the beam to support the wall above. Probably about $10/linear foot, but you need to have someone calculate the required size to support the wall.